The purpose of this guidance is to help manufacturers and sponsors understand how the TGA interprets regulations, and thus indicate how a manufacturer/sponsor can comply. This is a guide only, and manufacturers and sponsors are encouraged to familiarise themselves with the legislative and regulatory requirements in Australia. If necessary, seek professional advice as it is the responsibility of each manufacturer or sponsor to understand and comply with these requirements. This document will evolve over time and updates and clarifications will be included as required. Feedback on the guidance is always welcome. The Australian Government also accepted the Review recommendation that TGA retain responsibility for making decisions regarding market authorisation of therapeutic goods in Australia. The TGA will continue to assess applications for conformity assessment certificates for some devices and for the inclusion of medical devices in the Australian Register of Therapeutic Goods (ARTG). The purpose of this document is to provide an overview of how specific overseas assessments and approvals can be used by applicants for the purposes of supporting the basis for a possible abridged assessment of an application for a TGA conformity assessment certificate, or as the documentation required to be provided with applications for inclusion of medical devices (including IVDs) in the ARTG. Certificates and reports issued under the Medical Device Single Audit Program (MDSAP). intended for the same indications. Apart from the ability to use a broader range of overseas assessments and approvals in support of applications, there is no other change to existing regulatory requirements for safety, quality, and performance of medical devices authorised for supply in Australia, and no change to the TGA's existing regulatory requirements and processes. Guidance is available which outlines where assessment fees administered by the TGA can be reduced for both application audit assessments, and conformity assessments involving medical devices (including IVDs). Please see: Reduction of assessment fees for medical devices which provides additional information about the eligibility requirements and procedures used by the TGA. 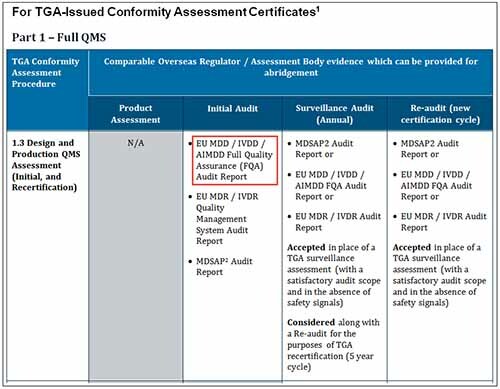 Evidence of conformity assessment needs to demonstrate that a manufacturer's quality management system meets certain regulatory requirements, and that their devices comply with the relevant essential principles. An acceptable overseas audit report or product evaluation report may contain information that will help to demonstrate that these requirements are met. For the possible abridgement of an assessment of a TGA conformity assessment application, you may provide certain documents from specified overseas assessment bodies to facilitate the TGA's overall conformity assessment evaluation process. This will result in the TGA being able to reduce the amount of assessment that it must undertake on a particular application. Table 1 outlines the documents that can be provided against the relevant conformity assessment procedures. This also includes reference to MDSAP reports, which can also be considered when assessing a conformity assessment application. The FQA audit report is an initial audit report that covers the same manufacturing sites and device categories as your application. You may provide the FQA audit report to the TGA with the supporting documentation for the application. If a sufficiently detailed report is provided, then we may be able reduce the assessment by undertaking a desk assessment of the QMS instead of an on-site audit. The FQA audit report is a recertification audit report (re-audit) that covers the same manufacturing sites and device categories as your application. You may provide the FQA audit report (re-audit) to the TGA with the supporting documentation for the application. the manufacturer has an MDSAP Audit Report for a surveillance audit that includes assessment of the change. You may provide the audit report to the TGA with the supporting documentation for the application. If the report is sufficiently detailed and the change has been assessed as satisfactory by the assessment body, then we may be able to abridge the assessment of the change. Any application for inclusion of a medical device in the ARTG must include certain information as required in the application form. Also, certain information must accompany the application in order to pass a preliminary assessment. Documentation to be attached to your application for ARTG inclusion. Applications for ARTG inclusion of certain medical devices must be selected for audit (refer regulation 5.3). TGA may also select any other application for inclusion of a medical device in the ARTG for audit where there are, for example, concerns about the device or information provided in the application. The Level of audit assessment may depend on the category and/or Class of a medical device, and the overseas evidence provided to the TGA in support of the application. Sponsors can submit requests with their applications requiring reduction of the audit assessment fees if the audit can be abridged (including for example requests to abridge assessments from Level 2 to Level 1 audit if appropriate). In such cases sponsors are required to provide brief justifications supporting their requests. TGA's delegate will decide whether such request is appropriate. The guidance on requests for abridged assessment is available on the TGA website. We have provided some examples on the TGA website on expected level of audit assessment for different devices with different conformity assessment documents. Table 2 provides a list of the documents that are required for different Classes of medical devices. Please review the list of conformity assessment documents provided in Table 2 for your Class of medical device. The categories of documents included as the Manufacturer Evidence and the Evidence of product review attached with your ARTG inclusion application, must appear in the same line in Table 2 to be accepted as the information approved to accompany the application. If you apply for inclusion in the ARTG of a Class I medical device intended to be supplied sterile (Class Is), and the manufacturer provided you with a copy of their EC Certificate issued by one of the European notified bodies under EU MDD 93/42/EEC, the following documents will be required. The EC Certificate issued under either Annex II.3 or Annex V must be submitted as your Manufacturer Evidence (EC Certificate issued under Annex IV or Annex VI is not appropriate evidence for Class Is medical devices). The next part of the table lists the documentation that you must provide with the application for ARTG inclusion of your medical device. In this case, there is no additional information which needs to be provided. If you apply for inclusion of a Class IIb medical device in the ARTG, and the manufacturer holds a MDSAP Certificate for their quality management system (QMS) and product approvals from FDA or Health Canada, you will be required to submit these documents as specified below. The MDSAP Certificate issued to the manufacturer of the device must be submitted as Manufacturer Evidence. The MDSAP certificate must be issued to the manufacturer stated on the labelling and instructions for use as the manufacturer of the kind of device for which you submitted your application for inclusion in the ARTG. Note: ISO 13485 issued by CMDCAS Recognised Registrar is only valid until December 2018. These documents will not be accepted commencing on 1 January 2019. US FDA: De Novo Decision Summary, or 510(k) Summary, or Premarket Approval (PMA). If you apply for ARTG inclusion of a Class IIb implantable medical device and submitted the manufacturer's MDSAP Certificate, TGA expects PMA from US FDA or Medical device licence Class III issued by Health Canada as the evidence of product review. The TGA will continue to assess the comparability of US FDA 510k and De Novo approvals when used to support applications for Class IIb implantable medical devices to ensure these approvals are appropriately aligned with Australian regulatory requirements. As part of this, applications for ARTG inclusion of Class IIb implantable devices are likely to be subjected to an application audit. As a result, the TGA encourages applicants to have and be able to provide the relevant supporting documentation which underpins these types of approvals, and applicants should also expect a request from the TGA for the device's clinical evidence. If you apply for ARTG inclusion of a Class 3 IVD medical device in the ARTG and the manufacturer provided you with a copy of their EC Certificate issued by one of the European notified bodies under IVDD 98/79/EC, the following documents will be required. The EC Certificate issued under either Annex IV.3 or Annex VII must be submitted as your Manufacturer Evidence. If you provide an EC Certificate issued under Annex IV.3, there is no additional information which needs to be provided. If you provide an EC Certificate issued under Annex VII, you will need to provide a Type Examination Certificate (issued under Annex V) with your application. Note: To improve accessibility, Table 1 has been split into smaller tables on this page, however all tables in this section should be considered part of Table 1. Considered for the purposes of abridging TGA's assessment of the change. MDSAP Certificates are issued to Manufacturers as defined by GHTF. Those legal entities that take responsibility for design, production, packaging and labelling etc. before placing on the market under their own name. Proposed that MDSAP certificates will only be used by Canada and Australia. MDSAP Reports are prepared for medical device organisations (Sites), including the site(s) of the manufacturer, that are audited. A site is variously defined in Brazilian, Japanese and US regulations as a location that undertakes specific types of activities related to the manufacture of a medical device. (i.e., a step in manufacture of a MD). An MDSAP report may relate to a Site that is within the scope of a Manufacturer's QMS, or may relate to a Supplier to a Manufacturer. The TGA's expectation is that a Manufacturer is responsible for all aspects of a QMS related to their device. An MDSAP AO's report shall similarly account for all aspects of the Manufacturer's QMS. The TGA can only use certificates and reports that relate to Manufacturers. If a manufacturer chooses to apply a CA procedure for a higher class of medical device, the criteria for accepting MDSAP reports or certification applies as if the device was classified at that higher class. Note: To improve accessibility, Table 2 has been split into smaller tables on this page, however all tables in this section should be considered part of Table 2. Annex IX, Chapter I (QMS) and III Annex IX, Section 4 (TDA) (based on a representative sample, BUT Class IIb implantable, for each device, except sutures, staples, dental fillings, dental braces, tooth crowns, screws, wedges, plates, wires, pins, clips and connectors. DCAS is required to make a decision to certify the design and certify the full QMS as a "single decision maker" for the Part 1 CA procedure. To be acceptable, MDSAP reports are to contain evidence of the extent to which requirements have been fulfilled; in particular, for critical processes that will determine whether a product complies with the Essential Principles. The TGA will continue to assess the comparability of US FDA 510k and De Novo approvals when used to support applications for Class IIb implantable medical devices to ensure these approvals are appropriately aligned with Australian regulatory requirements. Applications for ARTG inclusion of Class IIb implantable devices are likely to be subjected to an application audit. As a result, the TGA encourages applicants to have and be able to provide the relevant supporting documentation which underpins these types of approvals, and applicants should also expect a request from the TGA for the device's clinical evidence.